Mike Marek of Kent is tagged out sliding into second Saturday. KENT – The Kent White Sox 18U baseball team split a double-header Sunday against Harrison, dropping game one, 3-1, then taking the nightcap, 6-2, at Ryan Park in WBA Wood Bat League… Please login below or purchase a subscription to the Putnam County Courier to access this content. Kent’s Judi Barcavage had an RBI in wins over Ossining and North Salem last week. 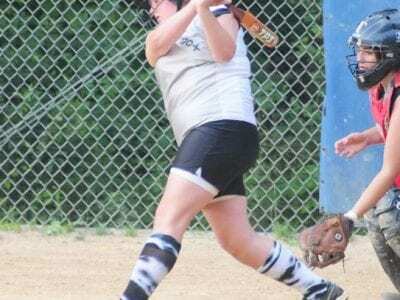 KENT – The Kent White Sox 16U softball team continued its summerlong roll last week, knocking off Ossining, 7-2, Wednesday and North Salem, 8-2, two days ea… Please login below or purchase a subscription to the Putnam County Courier to access this content. Rob Perez of the Bulldogs had two RBI and went 2-for-3 in a win over Nanuet. BREWSTER – The Tri-County Bulldogs 16U baseball team had a rough stretch last week, dropping three of five games. 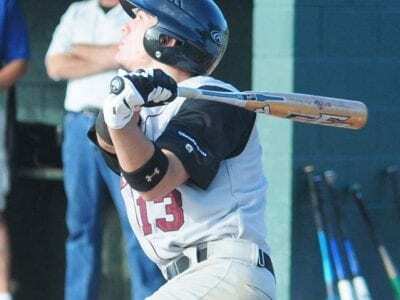 The Bulldogs dropped both ends of a double-header Sun… Please login below or purchase a subscription to the Putnam County Courier to access this content. MAHOPAC – The Mahopac 9U baseball team won its ninth consecutive game Saturday, sweeping a doubleheader against host Pelham, 14-8 and 10-3. Mahopac also beat New Canaan, 16-4, last Friday, and topped Pelham, 7-6, the prior Wednesday at Lakevie… Please login below or purchase a subscription to the Putnam County Courier to access this content. Carmel’s Jim Hanna drove in three runs Sunday in an 11-1 win over Somers National. CARMEL – The Carmel Cubs 16U Blue team picked up three more wins last week, upping its season mark to 12-3 with the playoffs just around the corner. Sund… Please login below or purchase a subscription to the Putnam County Courier to access this content. Above Right: Last Saturday the Mahopac Sports Association began fitting its young athletes with gear for the upcoming football season that gets underway next month. 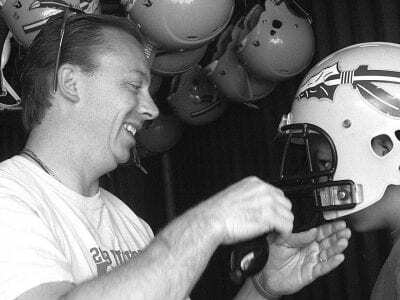 Robert Burt checks the fit of a football helmet worn by Christopher Hernandez, 11, of… Please login below or purchase a subscription to the Putnam County Courier to access this content. PATTERSON – The Patterson Pirates 10U baseball team got a sterling performance from pitchers Brian Harlin and Kyle Shilling last Friday, as the duo combined to no-hit Somers in earning a 15-0 win in four innings. Harlin was also the winner for… Please login below or purchase a subscription to the Putnam County Courier to access this content.